Its February, it is wet, it is cold and it is still dark at 7 in the morning and all we want is to see the sunshine peering through our bedroom. Well today, after a miserable raining grey week in York the sun decided to say hello and it was just like a Spring morning. 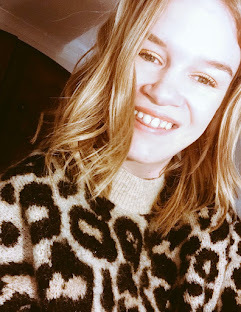 Perfect idea to wear my new animal print turtle neck jumper which I only bought last weekend. I was lucky enough to have some Christmas money which I hadn't gotten round to spending yet so I had to get this jumper. Pricey but it was something I had seen a few weeks ago and I had to get it. When I find something I love I just cannot take my eyes off it, I guess you could also say that about food too haha. I love finding really nice places to eat breakfast and my sister had mentioned about going to an independant coffee/cafe house in the heart of our home town in the centre of York. It is called Brew and Brownie and it is only a small inside so you have to get there earlier if you want to get a seat but let me tell you my friends it is so good, you'll just want to go back for more! It is only in York too. We started off by having coffee and I had a Flat White which I really love. I prefer stronger coffee and I am not a fan anymore of milky latte's anymore. So this perfect for me! Now moving onto food, we went for Breakfast but they had some lovely sandwiches too. I opted for American All Day Pancakes and took me ages to figure out which topping I was going to have but went for fruit compote with yoghurt and honey! Mmm, it was amazing! You get a stack of 4 pancakes but I was so hungry I cleared the plate! So my sister went for Avocado on toast with a poached egg which also looked just as good and my Grandma, she went for Eggs Benedict with Ham and Hollandaise sauce! Later on, we stopped off at Hotel Choclat at John Lewis and got ourselves some more coffee which meant another Flat White for me, a Valentines Day Hot Chocolate for my sister and an ordinary one for my Grandma. I love days that are like this, don't you?